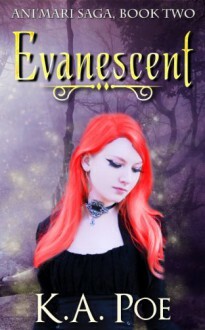 Evanescent is the second novel in K.A. Poe's Ani'mari series and is approximately 89,000 words in length (350 pages). If you have not read book one yet, please look for Ephemeral (Ani'mari Saga, Book One) available anywhere ebooks are sold! Using the strength of a relationship she had never thought possible, Victoria tries to come to terms with her cursed existence as an Ani'mari. But finding balance between what's normal and what's not proves difficult when you are surrounded by death. The Ephemeral Scroll has been taken, and with it, the Neco'mortis have vanished from Hazel Grove. Tori's Mentor prepares for the worst as he urges her to set aside her old life and embrace her destiny. As she struggles to hold on to the remnants of her humanity, she begins to unravel a history that she never wanted to know—a darkness she wished never existed.